Hey Love: Finds Under $40! Get The Look! Kate Bosworth!! ooo this is lovely! I'm all about finding bargains so I appreciate this look for less=D Thanks for sharing! Great look.. Even better for the price! She' so pretty, absolutely love what she is wearing! Just got married and still a student, you may be my new best friend... Love the bargain post! Nothing better than a nice find under 50.
ooh great finds! <3 the clutch! She really is so gorgeous no matter what she wears! Kate has such killer style...I wish I could raid her closet! I love Kate's style. It's so effortless! Me encanta el look !!! saludos guapa. totally lovin her sporty chic look. Love this post - I want that bag!! 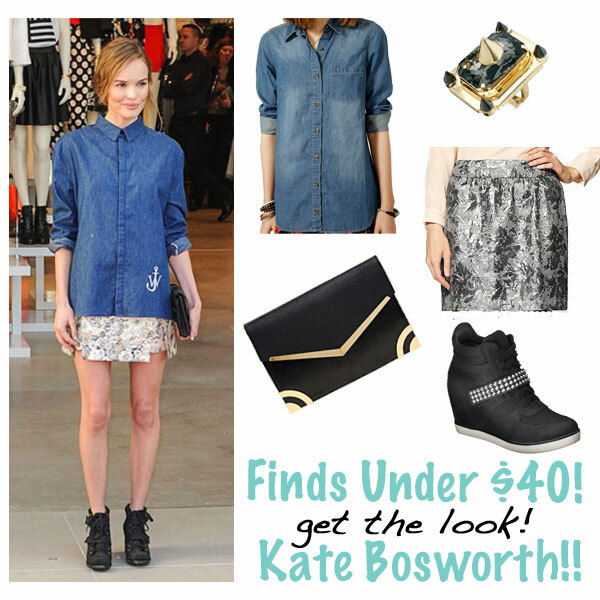 I've been obsessed with Kate Bosworth's style for a while, and I am digging how you recreated this look – so cute! I love this look, the sneakers and denim shirt are a great combo together.Nice finds. This is such a cute look, especially the skirt and jewelry. Definitely a great outfit. She is always so incredibly chic! LOVE THIS! Love this look, always love getting inspirations for new ways to wear my chambray tops! excellent post! love this kind of ideas! thanks for your visit...your blog is so nice! would you want to follow each other?? Kate Bosworth is so adorable - I'm totally crushing on that clutch and the ring! I actually like that denim shirt even better! Awesome finds lady! Though I'd wear something more polished and less edgy than Kate's outfit, I do love the clutch! Love how she dressed up those wedge sneakers with that pretty skirt - so cute! Its really a cute outfit. Skirt is very pretty. Great finds! Thanks for sharing, Ill need to do some shopping. Love this! Kate Bosworth is always so stylish and classy. I think it's great that you have managed to come up with an outfit almost identical for under $40! Well done! Such a great look, and your finds are so accurate too. Loving it! That is one pretty look! I love it. Such a fun look! I'm really loving denim/chambray shirts lately- totally obsessed with them! Wow, so many great, reasonable finds! Adorable! Love this look and love the prices you've pulled even more! as if it's all under $40! This outfit looks amazing- she looks so chic and I love your picks! Great post. I love this post, especially those shoes! Kate Bosworth is always featured on style blogs because she just has awesomely simple style. I like the clutch that you added to the outfit; it's so unique! That Kate Bosworth floral skirt is pretty! I love it.